Ron was in good spirits and addressed those present with confidence that the stadium project was progressing well. The discussions flitted from subject to subject during the evening with Paul FitzGerald starting of by reminding Ron of his pledge to have Trust representation on the board several years ago and certainly during the period leading up to the building and planning for the stadium. Ron suggested that now was not the right time and although not a Trust representative, he considered Club Director Gary Lockett to be a 'supporter'. Ron went on to say that his primary objective was to get the Club on an even keel within the new stadium and after that he was happy to review requirements. Ron was also informed that the Trust this season will surpass the £200,000 level of donations to Southend United and related causes. 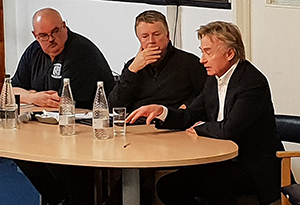 The discussion moved on to the lack of a Chief Executive at the club and Ron expressed the opinion that he had been unable to find the right candidate so had decided to carry out the duties himself. However in order to help grow the Club this was a position that would be required when we moved into the new stadium. Ron said that many, including him, hold fond memories of Roots Hall. However he expressed concern that Roots Hall was no longer fit for purpose, highlighting the fact the East stand has wooden floors which in the light of the Grenfell disaster was a worry. Having said that, as re-assurance a full fire safety certificate was in place. Ron bemoaned the lack of space to add areas that can be used on non-match days and thereby add further income streams. He also explained that the new stadium works must start by June 2019 with the 2nd stage in November and the total build period will be 2.5 years. He advised there are 3 architects involved in the plan and 3 project managers for the stadium, the retail & the residential aspects. The retail tenancy lettings are 42% pre let but 55% triggers extra funding. The tenants for the hotel have been agreed. He felt people may not realise what a massive project this is, with traffic planning meaning roads and pavements for a large radius from the site have to be upgraded, including Warner's Bridge and several existing Roundabouts in the town. This even means pavements have to be widened in some areas. He was asked if the new site will be a concrete jungle and replied that it certainly will not. As some evidence, he has already purchased 120 9m high trees which in view of the delays to the project are now 11m high and will cause greater transport problems now for the vendor! He advised that he plans a series of flythrough CGIs to help show supporters what the vision is. He was asked what can go wrong now, as he had expressed great confidence it will proceed. He advised that after council approval which he was confident would be given, a Judicial Review could cause hold ups or if the Government 'called in' the plans again. However there are numerous parties involved in getting the project proceeding and he remains confident of success. Ron felt that on an ongoing basis it will be likely he will need a partner for the project. He was keen to ensure there was no overspend as the Amex stadium have gone massively over budget and had cost £92M. He advised that he will shortly be writing off £8M of debt the football club owes to him and intends to write of the other £9M in the foreseeable future, with the intention of leaving Southend United debt free. A discussion followed about 'Enabling Development' and how much money is required in income terms to make the project viable. It was pointed out that the Stadium Development income is separate from Southend United's Income and that at some point detail needs to be forthcoming on how Southend United will be funded. There are 640,000 people living in the immediate locality and there is every possibility attendance could increase with a successful football team in Southend. In answer to a specific question about access, Ron said The Park & Ride idea was not a sensible option in view of the lack of sites for the 'Park' aspect. Several aspects of the footballing side were discussed and he made it clear that whilst there have been times he has gone into the dressing room, it is a rarity. Decisions regarding which players are employed, sold, released etc are all down to the manager to control within his given budget. He feels Chris Powell is an excellent manager and possibly the best he has employed during his reign at the club likening his open and honest leadership style to that of Steve Tilson. He felt Chris has been hit by an incredible run of bad luck regards injuries. Many players were discussed during the evening, including Nile Ranger, Michael Timlin's departure which many fans felt was a mistake, and Rob Kiernan's failure to overcome injuries. Ron was questioned regarding employing players who were injured at the time of being employed or who had a history of injuries. He advised that they have a network of scouts and a lot of information exchanges went on between clubs. He would like to keep Dru Yearwood as long as possible although accepted that in his long term interest he will undoubtedly move on. He felt Elvis Bwomono & Charlie Kelman are both great prospects. The decision to bring in Stockdale was not his but he felt putting Nathan Bishop in the team for an extended period at that time was a gamble that may not have been in Nathans long term benefit. Missing out on Lyle Taylor was understandable as Charlton represented a better prospect to Lyle. He was asked what targets we had lined up for January. He reminded the audience that frequently mid year teams get rid of players on loan etc who are unable to make the first team and there are not many 'Taylor Moore's' out there. He is aged 22 and Ron hopes to keep him beyond January. Discussions spread to Bilel Mosni, Adam Barrett's departure, Anton Ferdinand & Michael Turner's red card. Ron stated that he is not very good company after a loss by the team, as his wife and family will testify. He is deeply committed to its advancement and remains upbeat. Ron was thanked for giving up his time and for his enlightening comments.